Should you use this software? This question is for you to answer. We trust that if you manage a botanic collection, you will find Ghini overly useful and we hope that this page will convince you about it. This page shows how Ghini makes software meet the needs of a botanic garden. If you already know, and all you want is to do something practical, just install the software, then check our user-contributed recipes. So we have in a botanic garden both the physical space, the garden, as its dynamic, the activities to which the garden is dedicated, activities which makes us call the garden a botanic garden. At the other end of our reasoning we have the application program Ghini, and again quoting the Wikipedia, »an application program is a computer program designed to perform a group of coordinated functions, tasks, or activities for the benefit of the user«, or, in short, »designed to help people perform an activity«. Data and algorithms within Ghini have been designed to represent the physical space and the dynamic of a botanic garden. In the above figure, a simplified view on the database, the highlighted blocks are those relative to objects you definitely need insert in the database. We distinguish three main sections in the database. Start reading the graph from the right hand side, with the relevant Taxonomy information, then step to administering your Collection, and finally consider the physical Garden. An Accession represents the action of receiving this specific plant material in the garden. As such, Accession is an abstract concept, it links physical living Plantings —groups of plants placed each at a Location in the garden— to the corresponding Species. It is not the same as an acquisition from a source, because in a single acquisition you can access material of more than one species. In other words: a single aquisition can embark multiple accessions. An Accession has zero or more Plantings associated to it (0..n), and it is at all times connected to exactly 1 Species. Each Planting belongs to exactly one Accession, each Species may have multiple Accessions relating to it. An Accession stays in the database even if all of its Plantings have been removed, sold, or have died. Identifying the Species of an Accession consistently connects all its Plantings to the Species. Propagations and Contacts provide plant material for the garden; this information is optional and smaller collectors might prefer to leave this aside. A Propagation trial may be unsuccessful, most of the time it will result in exactly one accession, but it may also produce slightly different taxa, so the database allows for zero or more Accessions per Propagation (0..n). Also a Contact may provide zero or more Accessions (0..n). Specialists may formulate their opinion about the Species to which an Accession belongs, by providing a Verification, signing it, and stating the applicable level of confidence. If an Accession was obtained in the garden nursery from a successful Propagation, the Propagation links the Accession and all of its Plantings to a single parent Planting, the seed or the vegetative parent. Even after the above explanation, new users generally still ask why they need pass through an Accession screen while all they want is to insert a Plant in the collection, and again: what is this “accession” thing anyway? Most discussions on the net don’t make the concept any clearer. One of our users gave an example which I’m glad to include in Ghini’s documentation. At the beginning of 2007 we got five seedlings of Heliconia longa (a plant Species) from our neighbour (the Contact source). Since it was the first acquisition of the year, we named them 2007.0001 (we gave them a single unique Accession code, with quantity 5) and we planted them all together at one Location as a single Planting, also with quantity 5. At the time of writing, nine years later, Accession 2007.0001 has 6 distinct Plantings, each at a different Locations in our garden, obtained vegetatively (asexually) from the original 5 plants. Our only intervention was splitting, moving, and of course writing this information in the database. Total plant quantity is above 40. New Plantings obtained by (assisted) sexual Propagation come in our database under different Accession codes, where our garden is the Contact source and where we know which of our Plantings is the seed parent. activate the menu Insert → Accession, verify the existence and correctness of the Species Heliconia longa, specify the initial quantity of the Accession; add its Planting at the desired Location. edit Planting to correct the amount of living plants — repeat this as often as necessary. edit Planting to split it at separate Locations — this produces a different Planting under the same Accession. edit Planting to add a (seed) Propagation. edit Planting to update the status of the Propagation. activate the menu Insert → Accession to associate an accession to a successful Propagation trial; add the Planting at the desired Location. In particular the ability to split a Planting at several different Locations and to keep all uniformly associated to one Species, or the possibility to keep information about Plantings that have been removed from the collection, help justify the presence of the Accession abstraction level. People using Ghini only sporadically may prefer ignoring the database structure and look at it as two nested sequences of objects, each element of the sequence being necessary to add element at the next level. A quite complete set of Families and Genera are inserted in your database at the moment Ghini initializes it. So all you need is adding Species and Accessions, in this order. When placing a physical Plant (relative to an Accession) somewhere in the garden, you need to describe this “somewhere” digitally, as a Location in the garden. not-so-brief list of highlights, meant to whet your appetite. 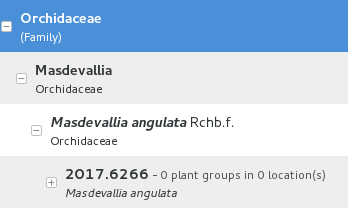 When you first start Ghini, and connect to a database, Ghini will initialize the database not only with all tables it needs to run, but it will also populate the taxon tables for ranks family and genus, using the data from the “RBG Kew’s Family and Genera list from Vascular Plant Families and Genera compiled by R. K. Brummitt and published by the Royal Botanic Gardens, Kew in 1992”. In 2015 we have reviewed the data regarding the Orchidaceae, using “Tropicos, botanical information system at the Missouri Botanical Garden - www.tropicos.org” as a source. Ghini will let you import any data you put in an intermediate json format. What you import will complete what you already have in the database. If you need help, you can ask some Ghini professional to help you transform your data into Ghini’s intermediate json format. Ghini will allow you define synonyms for species, genera, families. Also this information can be represented in its intermediate json format and be imported in an existing Ghini database. Ghini implements the concept of ‘accession’, intermediate between physical plant (or a group thereof) and abstract taxon. Each accession can associate the same plants to different taxa, if two taxonomists do not agree on the identification: each taxonomist can have their say and do not need overwrite each other’s work. All verifications can be found back in the database, with timestamp and signature. Ghini allows you associate pictures to physical plants, this can help recognize the plant in case a sticker is lost, or help taxonomic identification if a taxonomist is not available at all times. Ghini will let you export a report in whatever textual format you need. It uses a powerful templating engine named ‘mako’, which will allow you export the data in a selection to whatever format you need. Once installed, a couple of examples are available in the mako subdirectory. You can associate notes to plants, accessions, species, …. Notes can be categorized and used in searches or reports. All changes in the database is stored in the database, as history log. All changes are ‘signed’ and time-stamped. Ghini makes it easy to retrieve the list of all changes in the last working day or week, or in any specific period in the past. Ghini allows you search the database using simple keywords, e.g. : the name of the location or a genus name, or you can write more complex queries, which do not reach the complexity of SQL but allow you a decent level of detail localizing your data. Ghini is not a database management system, so it does not reinvent the wheel. It works storing its data in a SQL database, and it will connect to any database management system which accepts a SQLAlchemy connector. This means any reasonably modern database system and includes MySQL, PostgreSQL, Oracle. It can also work with sqlite, which, for single user purposes is quite sufficient and efficient. If you connect Ghini to a real database system, you can consider making the database part of a LAMP system (Linux-Apache-MySQL-Php) and include your live data on your institution web site. The program was born in English and all its technical and user documentation is first written in that language. Both technical and user documentation use gettext, an advanced tool for semi-automatic translation. The program has been translated and can be used in various other languages, including Spanish (97%), French (82%), Portuguese (71%), to name some Southern American languages, as well as Ukrainian (100%) and Czech (71%). Translation of documentation goes a bit slower, with only Ukrainian, Spanish and Italian at more than 50%. Installing Ghini on Windows is an easy and linear process, it will not take longer than 10 minutes. Ghini was born on Linux and installing it on ubuntu, fedora or debian is consequently even easier. MacOSX being based on unix, it is possible to successfully run the Linux installation procedure on any recent Apple computer, after a few preparation steps. The installation process will produce an updatable installation, where updating it will take less than one minute. Depending on the amount of feedback we receive, we will produce updates every few days or once in a while. Ghini is continuously and extensively unit tested, something that makes regression of functionality close to impossible. Every update is automatically quality checked, on the Travis Continuous Integration service. Integration of TravisCI with the github platform will make it difficult for us to release anything which has a single failing unit test. Most changes and additions we make, come with some extra unit test, which defines the behaviour and will make any undesired change easily visible. Ghini is extensible through plugins and can be customized to suit the needs of the institution.